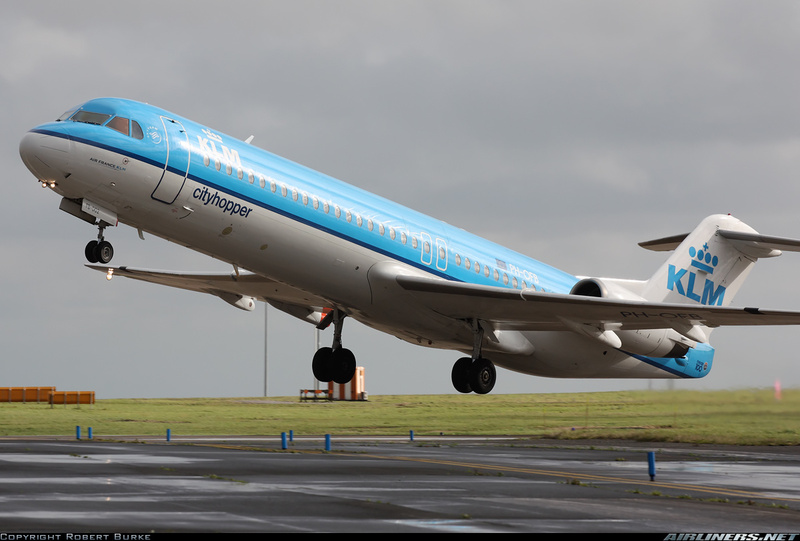 The Fokker F-28-0100 was an updated and lengthened version of Fokker's popular F-28 regional jetliner, introduced in 1988 alongside its smaller stablemate the Fokker 70 (F-28-070). It seats 107 and can be used for flights of up to 3100 Km. The F-100 has state of the art avionics including a very sophisticated flight management system that automatically controls the engines' power settings to suit the flight profile which is programmed into the unit before flight. 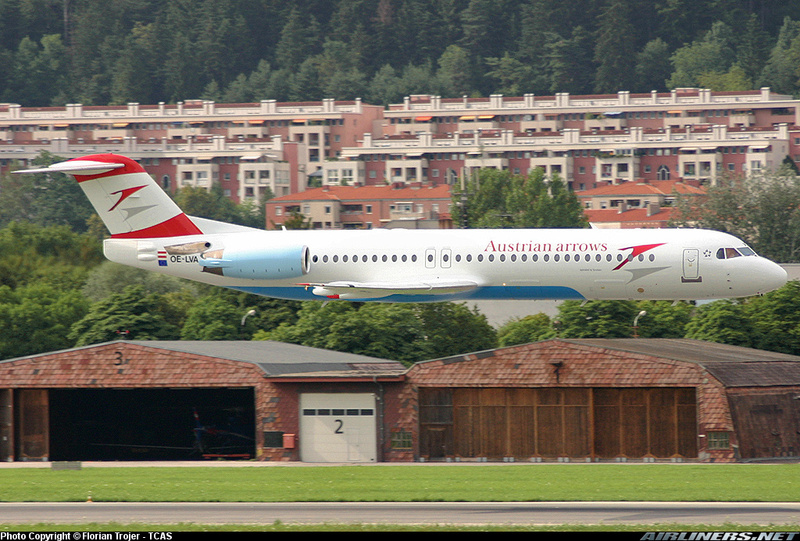 The aircraft itself was very successful, but Fokker's mismanagement forced the company into bankruptcy in 1997. 283 F-100s had been delivered by the time the production line was closed down. The fuselage is two halves from nose to tail. The cabin windows are open, with no clear parts provided for them. Either fill them or Krystal clear/Clearfix them; decal film just won't do it. No interior detail is provided, and the small windows would render any interior redundant anyway. The cockpit windows are the old-fashioned Airfix style strip, which makes getting them to fit properly without either breaking or falling into the fuselage something of a challenge. The panel lines are nicely engraved and match up well. The APU exhaust is left open. It can easily be blocked off with a small scrap of plastic card painted black. If the windows are left open, the interior should be painted black to prevent the model from looking toy-like. Revell advises that 4g nose weight will prevent this one from becoming a tail sitter. Two clear parts are provided for the under fuselage anti-collision beacon and rear navigation light mounted at the tip of the tail. There are several tiny antenna moulded the right fuselage half that could become casualties of the building process unless care is taken. The two piece wings have nearly their complete trailing edge moulded as part of the upper halves. The lower halves will need a bit of tweaking in order to ensure they fit without a step. one pair of wing fences wraps around the leading edge and two pairs of flap fairings wrap the trailing edge. Revell gives us these as separate pieces to avoid alignment problems. Finely scribed lines show their correct locations. Separate wing tip navigation light lenses are provided on the clear sprue. These are a bit of a challenge to clean up and glue in place due to their small size. The wings mount to the fuselage with two pins rather than the traditional locating tab. These are substantial enough to give no problems. The fit of the wings is precise enough that they may be left off until after painting and decalling are complete. The tailplanes is a one piece moulding that is designed to slot through the top of the tailplane before the fuselage is closed. This will make doing any scheme where the fin needs an overall decal very difficult. The problem may be solved by cutting the tailplane in half and assembling it from either side after the fuselage is assembled and the paint and decals are on. The engines are offered in left and right halves. The pylons are separate pieces which makes painting much simpler. Intake and turbine fans are provided. There are a couple of ejector pin marks inside the exhausts and mould marks in the intakes which need cleaning up before the engines can be glued together. The landing gear struts and wheels are finely moulded and nicely detailed. They could use some brake lines and whatever else the modeller likes, but will look good without. There is an option for raised gear, but no stand is provided. As with all 1/144 kits, the gear doors are overly thick and may be sanded down or replaced if the modeller wishes. I don't compare models to drawings or published measurements. When assembled it looks like an F-100. The decal sheet is very complete, with lots of stencils and multiple choices. Revell's decals have lately been drawn by Danny Coremans of Daco Products. You get the level of detail commonly found in the better aftermarket sheets right in the box. 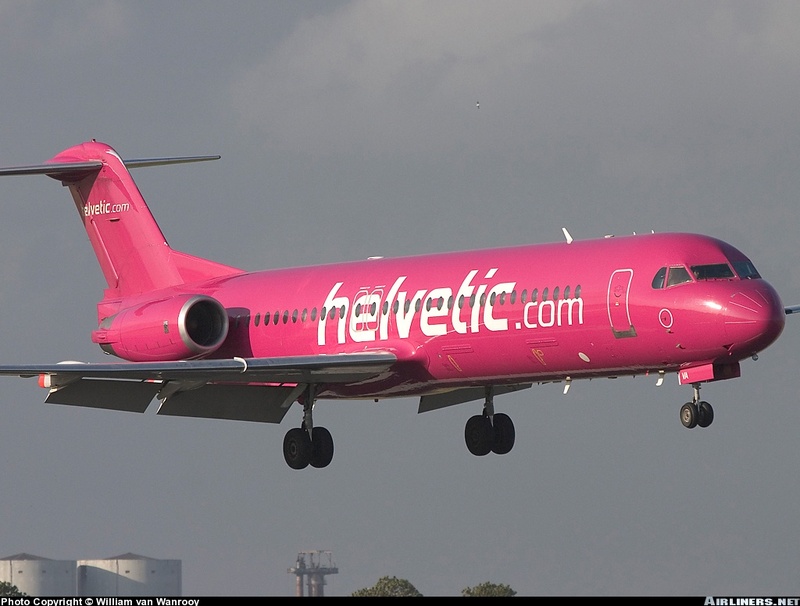 This kit offers the choice of Helvetic's very eye catching magenta, KLM Cityhopper or Autstrian Arrows. Window decals are not provided and must be sourced separately if desired. There are many different aftermarket schemes designed to fit this kit. They don't have anything for Austrian Arrows though. This kit may be easily cut down to portray an F-70, making the range of possible subjects even larger. Extratech recently released a set of brass details if you have the urge to dress the kit up a little. Highs: Delicate parts with a lot of detail for 1/144 scale. Good colour scheme options and many aftermarket schemes available. Lows: Delicate parts mean that they can easily be broken or lost. Care must be taken while removing them from the sprues and handling them while building. One piece tailplanes make some schemes difficult. Verdict: This is a fun little kit that gives little trouble.